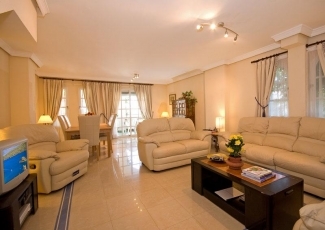 Our home from home in Spain, you will find everything you need for a comfortable and enjoyable holiday in this well appointed duplex. 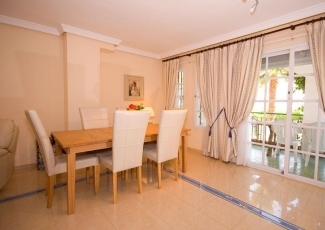 It is set in a quiet residential area of Estepona, in a gated community, just minutes walk to the beach and port where there are numerous restaurants and bars, as well as local shops, newsagents and supermarkets. The old town of Estepona is a 20 minute stroll along the "Paseo Maritimo"; the seaside walkway, which is beautifully maintained with tropical plants, water fountains and wonderful sculptures. Our apartment is one of 69 residences in a crescent shaped building, we benefit from being right on the end and facing due south, so in addition to all day sunshine, we also have the advantage of not being attached to another apartment on either side so it's very quiet. The apartment has it's own front door, so no need to use any of the communal areas of the building, and we have a small private front and back garden. There is private parking for residents just outside the back door. There is a shared swimming pool, with a separate children's area, and there are two sunbeds in the private front garden for your use. There is a large table on the terrace for outside dining. Indoors, downstairs has a newly fitted cloakroom, a brand new kitchen and a well equipped lounge and dining area. There is TV, video, DVD player and satellite receiver in the lounge, and also a i-Pod docking station. 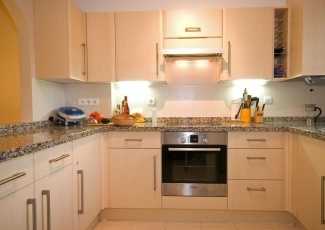 The kitchen is fully equipped with all the usual appliances; washing machine, dishwasher, microwave, toaster etc and full dinner service and glasswear for 6 people. There is an oven and ceramic hob and all the equipment you will need to cook a full dinner, if you so choose. The ground floor is fully air conditioned. Upstairs, there are 3 bedrooms, the master bedroom which is en-suite, and has a glassed-in terrace with work area and a table and chairs for taking in the evening view or a morning coffee. There are two more bedrooms, one double, and one twin, which share a bathroom. The master bedroom has A/C, the other two rooms have fans. 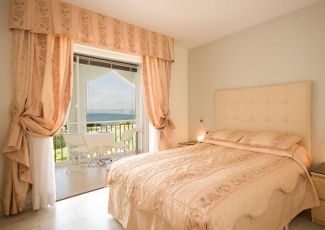 All bedlinen and towels (including beach towels) are supplied. There is a digital safe in the master bedroom, which you can set to your own code. At the workstation, there is a USB connected printer, mouse, keyboard etc if you need to bring a laptop to so some work, or maybe just to print your boarding passes after checking in on line. Wireless Broadband is connected which you are welcome to use. You may also use the house phone to take incoming calls, but we have to charge for outgoing calls. The master bedroom has been recently redecorated and now has a large cream leather headboard and very stylish furniture. The views from the terrace of the bedroom are stunning, and you can see across to Gibraltar, and on a fine day, the Atlas mountains of North Africa.